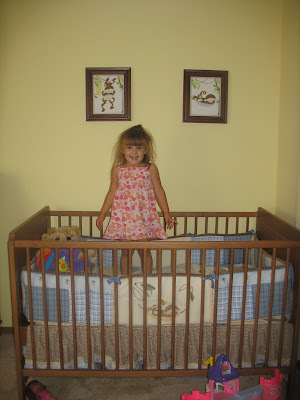 The OC Mama: Amelia trying out her brother's new crib. Bella has the same castle Amelia has in that picture! Where did you find the monkey pictures? I love them! I think it looks great. I don't think those pictures look too small. If you had anything bigger, you would have to worry about accidents if it falls off the wall-- unless you did a quilt or cloth wall hanging. I only worry about the accident thing because a picture did fall of the wall when Bella was little and gave her an ugly goose-egg on her head. The GUILT! Oh, the guilt still gets me. That's the perfect size! Be sure to wrap them with styrofoam or another padding, just in case they do fall. I'm kidding! I'm not that neurotic! ;-) Lol.